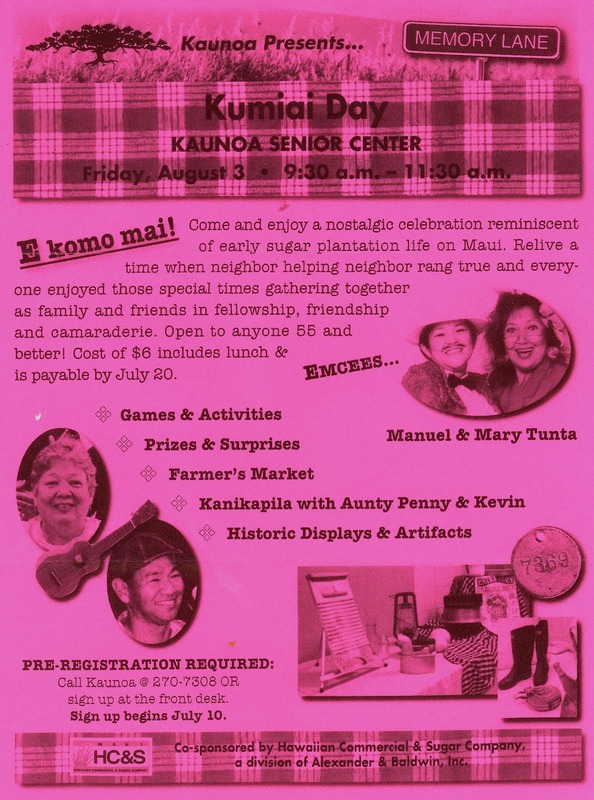 Just a little post to give a shout-out to the people who organized Kumiai Day at the Kaunoa Senior Center on Friday! Took a short stroll down memory lane with my Dad and we enjoyed it so much! This is part of the display that greeted us as we entered the grassy area of the Center. You had to take a bango number in order to win a door prize. There were some great prizes! There was an entire room of photos and artifacts to enjoy. Lots of people huddled around the camp diagram books. Here's the Hamakuapoko camp diagram. Our house was #1588, across from St. Ann's Catholic Church. Any H'Poko people out there who can ID their homes? We had a washboard like this one. During my time we upgraded to a wringer washer, kind of like this one. Here's a portion of the display of home-made toys. There was a table to try the games. Remember those paper hats? Strawberry ice cake, just like the good old days! There was also boiled peanuts, lilikoi juice, and pieces of sugar cane to try. salted cabbage, macaroni salad, and rice. Dad met up with another H'Poko old-timer. Emcees Mary and Manuel Tunta made us LAUGH! 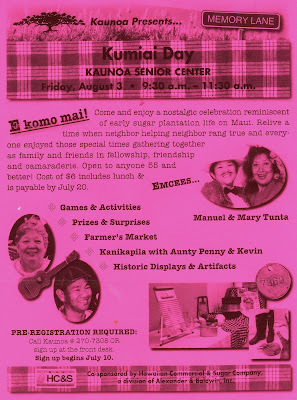 Kanikapila with Aunty Penny & Kevin was so relaxing and fun! in the Middle of the Sea"! Maybe next time. Hopefully there will be a next time! I think they should make this an annual event!